Transmit a color video signal up to 400M / 1200Ft; and a full motion monochrome (B&W) video signal up to 600M / 2000Ft. Passive; No power required. Eliminate coaxial cable. Built-in Filter: 0~6MHz. Use RJ45 Jack or 6 screw type terminal to connect between units. Long Range Twisted Pair Transmission System. Transmit a full motion color or monochrome video signal and data signal (RS422; RS485). Color range 1500m; B/W video signal up to 2400m. Three position range switch for gain select on Transmitter. Five position distance range switch on Receiver. System is integrated with alarm sensor(PIR; magnetic; etc) or data(pan; tilt; zoom). Built-in transient protection and ground lifting; damaging voltage spike problems are eliminated. Uses an Unshielded Twisted Pair cable (UTP); like CAT5; to transmit full motion camera video signal in B&W up to 2000ft / 600m and in color up to 1200ft / 400m. Built-in Filter: 0~6MHz with Extra Interference Rejection. Passive; no power equired Fast; easy installation; saving time and money. Substantial savings on the cost of the cable itself. Uses an Unshielded Twisted Pair cable (UTP); like CAT5; to transmit full motion camera video signal in B&W up to 2000ft / 600m and in color up to 1200ft / 400m. Built-in Filter: 0~6MHz with Extra Interference Rejection. Passive; no power required. Fast; easy installation; saving time and money. Substantial savings on the cost of the cable itself. Transmit a color video signal up to 300M / 1000Ft; and a full motion monochrome (B&W) video signal up to 500M / 1600Ft. Transmit power signal up to 200M / 600Ft. (Please see Voltage Drop List). Transmit data signalup to 300M / 1000Ft. BNC male with RJ45 Jack; male and female 12V DC plug on one device. Video; camera power; data (RS422; 485) transmission over one standard CAT5 cable. Wave Filter Design; Anti-Static Design; Confirm to IEC 61000-4-2:1995 Standard Interference RejectionABS Outer Shell. Transmit a color video signal up to 400M / 1200Ft. and a full motion monochrome (B&W) video signal up to 600M / 2000Ft. Passive; No power required. Eliminate coaxial cable. Built-in Filter: 0~6MHz. Use RJ45 Jack or 6 screw type terminal to connect between units. 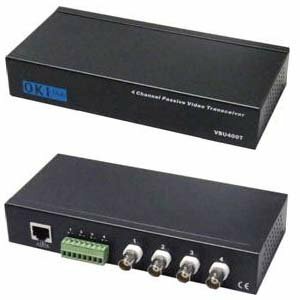 VBU110RJ-DCPA is a passive video and power balun device capable of transmitting baseband video signal and delivering 12 VDC power to the camera using UTP cable. This device is designed to be used with VBU05DC-1UPA; VBU09DC-1UPA and VBU16DC-1UPA passive video balun power assurance hub. Passive video signal transmission up to 1000ft / 300m and provide the camera with 12 VDC @ 300mA maximum. It has a very efficient step down power converter and regulator. It also supported the following baseband video signal systems: PAL; NTSC and SECAM. Transmit a full motion color video signal up to 1200M / 4000Ft and a full motion monochrome (BandW) video signal up to 2400M / 8000ft. Supports all bandbase signals including PAL; NTSC; SECAM. Signal Transmission via UTP CAT5 / CAT5e. Transmission Signal 1Vpp Composite Video. Built-in transient protection and ground lifting; which eliminates damaging voltage spike problems. Built-in Filter: 0~6MHz . Can work with 4-channel Hub or 1U rack mounting receiver panel. A wide range of active video baluns are available at SF Cable. You can order them with a few clicks and get them delivered at your doorsteps. You can choose from an array of products which includes 4CH Video Balun, Video Balun active receivers, Video Balun active transmitter, Video Balun BNC to UTP Terminal w/Filter Pair, Video filter Baluns, Video Baluns with extra interference rejection, Video/Power/Data Balun, 8-Ch Video Baluns, Single Channel Video Balun, Active Video Transmitters, Active Video Receivers, 4-Ch Active Video Baluns, and other products with different specifications to meet your requirements. All products on offer go through standard testing to ensure customer satisfaction. We offer discounted rates for our customers without compromising with the quality or safety of the product.